We have a new interview from one of Celtic Music's greats, Mr. Paul Byrom. You may remember Paul from his long stint with the popular Celtic touring show Celtic Thunder. Paul is often hailed as one of Ireland’s premier tenors. He’s certainly one of the busiest. The Dublin-born singer has been in the music industry for over 20 years. He recorded his first album, “The Golden Voice” as a boy soprano, when he was 14 years old. Paul came by music naturally, with a mother who is a concert pianist and a father who played guitar as a hobby. He grew up listening to both classical and mainstream music, ranging from Mozart to Buddy Holly – to the Eagles. This wide variance in genre and style shows even today during his concerts, which are a blend of traditional Irish tunes and more contemporary music. Byrom then released a Christmas album titled “I’ll be Home for Christmas”, in 2008. This album made the Classical Billboard Charts. Paul became an original member of world-renowned singing group Celtic Thunder when it launched in 2007, touring America and Australia with the group and participating in recordings that took the group to the #1 spot on the World Billboard charts six times. He has performed for dignitaries and politicians such as Emperor Akihito of Japan, Former Irish Presidents Mary McAleese and Mary Robinson, and for former U.S. President Barack Obama. He left Celtic Thunder in 2010 and has become a popular solo artist ever since. ​A newer recording, “This is the Moment," debuted at #1 on the World Billboard Chart and was shortlisted for a Grammy nomination. He’s been named the "Irish Tenor of the Year" by the Irish Music Association numerous times and continues to tour, especially in the United States. For the past two years, Paul has starred in Christmas Pantos at the famed Helix Theatre in Dublin – first in “Beauty and the Beast” and then in “Robin Hood," where he shared the stage with his real-life dog Bradley. He is also a featured performer in “The Showman is Coming," touring various locations in Ireland. For a taste of Paul's talent, check this video out. CG: Do you remember the first time you decided it was comfortable and even enjoyable to sing in front of other people? PB: I remember as a very young child always performing for friends of my parents and family when they would call around to visit. It seems as far back as the age of four I used to do this, in particular to the Stevie Wonder classic, “I just called to say I love you”. I would mimic his actions and all. Then I remember being in my first show as a child and just being hooked to the adrenalin of performance... and have been since. CG: Having interviewed many Celtic musicians, and also having performed alongside many more, I know that performing this type of music stems from a love for it deep inside. Do you have family roots, or a special performer that has inspired this same love for Celtic music within you? PB: To be honest, no one in particular comes to mind. For me, Celtic music is in your make up. It's in your soul. It stirs emotions that little else in music does. Perhaps that’s from the pride of being Irish and the history we have. A lot of the music is emotional and heart breaking, so as a primarily ballad style singer, it's everything I love in singing. CG: Most Celtic performers have voices much rougher than yours, and, as with rock and roll, seem to, at first, represent the “authentic” sound, and yet you often seem to transcend any trained or studied voice into a realm that seems the most authentic of all – a sound that takes the listener back to the hopes and fears of their predecessors, to a life which seemed so much happier, even magical and mystical. There are certain inflections in your tone, and movements within what would normally be a single note, that literally melt hearts, bringing, at times, tears of joy, and at other times, tears of sadness. PB: Thank you. I have trained as an opera singer originally, and over time I became, I suppose, more main stream. I hate being pigeon holed and I suppose through that, I have developed my own style. Some love it, some hate it!!!!!!! CG: Do you think it is possible that your ancestors, or your DNA, have played a role in you taking your talent to such a high level – a level perhaps you could not have avoided, had you even tried? PB: I think if you're a singer and performer, it's very hard to ignore the urge and the want to perform. It's in your DNA for sure. That being said, I know many who have the genes and have done nothing with it. Encouragement and education plays a huge part. CG: Just out of curiosity, do you speak Gaelic? PB: Ha! Very few words of it. It's an extremely difficult language, but one I’m very proud of. CG: I’ve noticed that, while you stay true to the basics of an Irish tenor performance, you often drift into a vaudeville or theatrical style. What brings this out in you? PB: I was honoured to sing for President Obama on his first St. Patricks Day in the White House. CG: I know that you smile quite often during your performance, but I think I have seen you hold back a tear, a time or two, and I wonder how much of your performance is driven by pure emotion? PB: All of it. I only sing songs now that I believe I can deliver with all my heart. CG: During a complex tune, do you ever find yourself thinking about something else totally unrelated to the music – for instance your family, your home, or your next performance? PB: There are times when your mind will drift to family or friends or loved ones. Sometimes if it's a performance I'm not enjoying, I can drift to… WHAT AM I DOING HERE!!!!! CG: Your tours in the U.S. - what do you enjoy about them, and how do audiences respond? PB: I LOVE performing for Americans. I find that most of my audience are of Irish descent and during the concerts, there are a lot of memories struck for people. I love meeting people after the shows and hearing their personal stories, and those of their parents, grandparents or even great grand parents, and their journeys to America to start a new life. The response from them is very genuine and it's fundamentally that support that has me returning on such a regular basis. PB: I believe in a good night out. I believe life is far too short to take it too seriously, so if you want to take your mind off that stuff for a couple of hours, I promise that at my concert. What you see is what you get. I am as open and honest as I can be on stage and I believe that when you leave, you will leave feeling like you know me a bit better as a person and a singer. For more information on Paul Byrom and on his upcoming U.S. tours, visit www.paulbyrom.ie. It finally happened!! 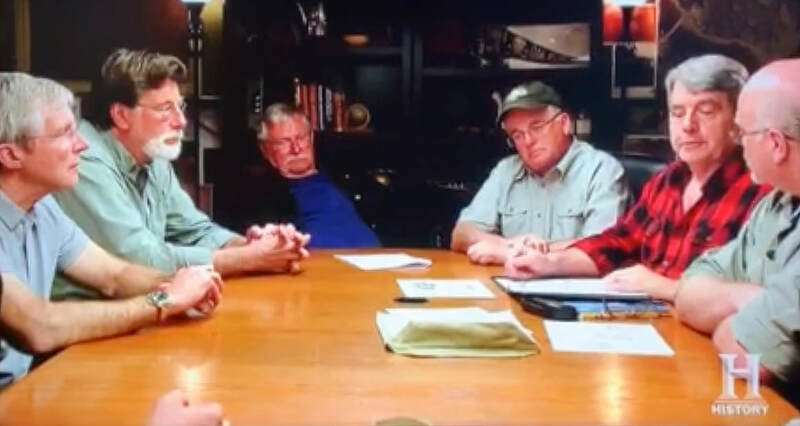 I appeared on Curse of Oak Island after waiting almost two years. These people are great – the Lagina team, the Prometheus team, and the History Channel. Can't say enough nice things about them. Of course my intricate theory couldn't be completely portrayed in the space of 10 or 15 minutes, but they did a pretty darn good job and I can't thank them enough. My new book, Oak Island Knights, is now available on Amazon. Both Craig Waltman and Alison MacRae have sent in great new articles which will be posted under their respective author tabs. Meanwhile, Alison has been doing a wonderful job keeping our Facebook site running smoothly.